Chocolate pudding … you can do it healthier! For candy: Dried dates, raisins, plums, cranberries, apricots, and goji berries are foods (eat sparingly) that will satisfy your cravings for chewy, candy- like treats. 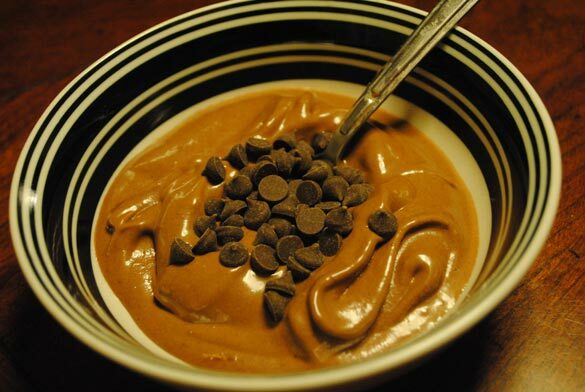 For chocolate pudding: Mash a ripe banana with a splash of almond milk and a few tablespoons of cocoa powder. Top with fresh berries and enjoy. For sweets: Slice a ripe piece of fruit, or have dried fruit mixed with nuts or a bowl of fruit with honey. Roll grapes in coconut sugar (found in health food stores) and freeze, or have a homemade energy bar.